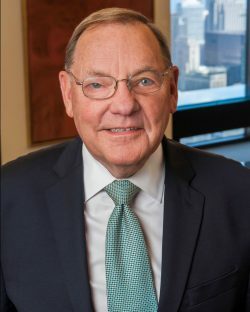 Mr. Canning co-founded Madison Dearborn Partners, LLC (“MDP”) in 1992 and served as its Chief Executive Officer until becoming its Chairman in 2007. MDP has raised investment funds with more than $22 billion in limited partner commitments from over 400 endowments, pension funds and other sophisticated investors. MDP is one of the most experienced and successful private equity investment firms in the United States with 43 investment professionals. Prior to co-founding MDP, Mr. Canning spent 24 years with First Chicago Corporation, most recently as Executive Vice President of The First National Bank of Chicago and President of First Chicago Venture Capital. 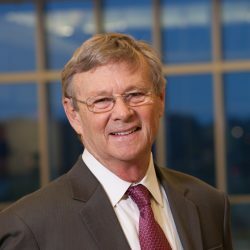 Mr. Canning has more than 35 years of experience in private equity investing and currently serves on the Boards of Directors of Corning Incorporated and Milwaukee Brewers Baseball Club; and is a Life Trustee of Northwestern University. Mr. Canning is Co-Chairman of the Big Shoulders Fund, a Director and Chairman of Northwestern Memorial Hospital, a Trustee and Former Chairman of the Museum of Science and Industry, former Director and Chairman of The Economic Club of Chicago, former Chairman of The Chicago Community Trust, a Trustee and former Chairman of The Field Museum, and former Director and Chairman of the Federal Reserve Bank of Chicago. 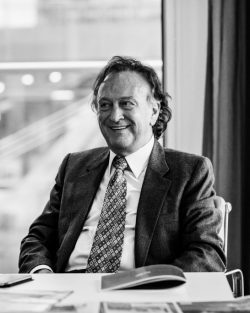 Last year in a rare interview before the launch of Ballymore's latest Irish development, Dublin Landings, Sean Mulryan said, "The only thing I can guarantee this morning is design, creativity, energy and quality. We're going to build the best." It was no surprise therefore, that at the Property Industry Excellence Awards, Ballymore was voted Overall Winner with the judges declaring that, "Mulryan consistently displays the very highest level of quality" It was 35 years ago in a quiet village in County Kildare, Ireland, that Sean Mulryan and his wife, Bernardine, sold their car and most of their belongings, to allow them open their first show house. They were going to build residential homes in and around Ballymore Eustace and call the company Ballymore. Sean had sprung from humble beginnings, a stone mason from County Roscommon, but from an early age he had always nurtured a very clear vision for the building trade. His dream was not just to build houses, but to regenerate unwanted land and create newer and better places for people to work and live. They went on to become the most successful and most innovative developers in Ireland, but it was London which catapulted the company into global recognition. Sean Mulryan became acutely aware of the potential of the unclaimed, unloved wasteland that was London's East End, and when that city suffered a serious property crash in the 1990's, he saw his opportunity and set about acquiring great stretches of land that was prime for regeneration. The rest is history. To date Ballymore has created completely new localities in the area, an area no longer a wasteland but perhaps the most sought-after neighbourhood in which to live and work in London. Award winning developments were to come, such as Pan Peninsula and the luxurious New Providence Wharf at Canary Wharf, itself a place which has surpassed the City of London as Europe's leading financial district. Other pioneering developments include Royal Wharf which has regenerated the Royal Docks, the recently launched Goodluck Hope and, of course, City Island, where Sean's vision of urban life embracing living art has become a stunning reality. City Island is now the home of English National Ballet and London Film School and a thriving community where students, office workers and residents are continually inspired by their cultural surroundings. But Ballymore has also become a pathfinder for the renewal of other areas in London. In Nine Elms, work is near completion on the exciting Embassy Gardens, to where the United States Embassy has relocated from their former home in Grosvenor Square. Embassy Gardens will also be home to the inspirational Sky Pool, just another example of the vision of the founder, CEO and Chairman of Ballymore. The company which also has a vast experience with city centre regeneration developments in Central and Eastern Europe, will continue to ply its trade in Ireland and the UK with work in the pipeline for major developments in Birmingham, Brentford, Dublin, Ladbroke Grove and further East in London on the River Thames. The company remains a family business with three of Sean’s five children actively involved. His son John is Managing Director of the UK operations. Sean still resides in that quiet village of Ballymore Eustace with his wife and co-founder Bernardine. He would like to have more time for his interests in Gaelic Games, Rugby and Horse Racing but he has said that for some time to come he is committed to his guarantee of "design, creativity, energy and quality”. 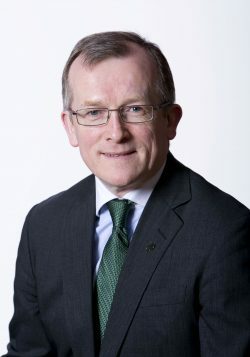 Niall Gibbons was appointed Chief Executive of Tourism Ireland, the organisation responsible for marketing the island of Ireland overseas, in June 2009. Since his appointment, Niall has overseen the marketing of Ireland as a tourism destination across the world, leading a team of 150 staff in 23 markets. 2016 was the best year ever for tourism to the island of Ireland, surpassing previous records, with about 10.5 million visitors. The World Economic Forum has ranked Ireland 5th in the world (out of 140 countries) for tourism marketing and branding effectiveness. Niall has spearheaded Tourism Ireland’s development in the digital area, with the launch of the global website Ireland.com, and has overseen the organisation’s emergence as a leader in digital marketing and social media. Today, Tourism Ireland ranks fourth in the world among tourism boards on Facebook, with over 3.8 million active fans and over 760 million global connections, fourth in the world on Twitter and third on YouTube. He has also led the expansion of Irish tourism into the new, fast-growing tourism markets of the future, such as India and China. He led the development of Tourism Ireland’s Global Greening initiative, which has brought tourism to the heart of St Patrick’s Day celebrations across the world – in 2017, hundreds of sites and icons around the world will go green, generating positive media coverage for the destination overseas worth over €10 million. In the area of screen tourism, he has developed ground-breaking partnerships with LucasFilm and HBO, which have allowed Tourism Ireland to leverage the global phenomena that are Star Wars and Game of Thrones to showcase the island of Ireland, in a new way, to hundreds of millions of fans across the world. Tourism Ireland has special responsibility for helping Northern Ireland to realise its tourism potential and Niall has spearheaded major global marketing initiatives for Northern Ireland, around the globe. He works tirelessly across jurisdictions to foster North-South and cross-community relationships. Niall is a business graduate of Trinity College, Dublin and a Fellow of the Institute of Chartered Accountants in Ireland. He is Deputy Vice President of the Dublin Chamber of Commerce, is a member of the Northern Ireland Executive’s Tourism Strategy Development Committee, sits on the Export Trade Council for the Irish Government and is a member of Culture Ireland’s Expert Advisory Committee. Niall is married to Marion and they have four children. Dr. William P. Magee Jr. is a plastic and craniofacial surgeon who founded Operation Smile in 1982 with his wife, Kathleen S. Magee, and serves as the organization's Chief Executive Officer. Operation Smile, headquartered in Virginia Beach, Virginia, is an international children’s medical charity with a presence in more than 60 countries, whose network of more than 13,000 medical volunteers from over 80 countries is dedicated to helping improve the health and lives of children. Since its founding in 1982, Operation Smile has provided hundreds of thousands of free surgeries for children and young adults born with cleft lip, cleft palate and other facial deformities. To build long-term self-sufficiency in resource poor environments, Operation Smile trains doctors and local medical professionals in its partner countries so they are empowered to treat their local communities. Operation Smile also donates medical equipment, supplies and provides year-round medical treatment through its worldwide centers. Dr. Magee has trained and mentored thousands of physicians worldwide. A featured guest on many network television programs, Dr. Magee is also a sought-after keynote speaker for corporate and national meetings. In July 2013, he gave one of the keynote addresses to the National Speakers Association (NSA) in Philadelphia. Dr. Magee received a D.D.S. from the University of Maryland, M.D. from George Washington University Medical School, served his general surgery residency at the University of Virginia Medical School, and received the Fulbright-Hays Scholarship Grant to study in Paris, France with Dr. Paul Tessier in 1975. He then received his plastic surgery training at the Eastern Virginia Medical School in Norfolk, Virginia. Dr. Magee has been awarded honorary doctorates from some of the finest universities worldwide, including the Karolinska Instituet in Sweden in 2014. In 2016 he received the Eminent Persons Award from the World Information Technology and Services Alliance (WITSA), was named a Disruptive Innovator in 2015 at the Tribeca Disruptive Innovation Awards, was awarded the American Society of Plastic Surgeons’ Honorary Citation Award in 2014, the American Society of Maxillofacial Surgeons’ Tagliacozzi Award in 2013, was highlighted in US News & World Report’s issue “America’s Top Leaders” in November 2009, and was given the National Medal for Peace and Friendship Among Nations in Vietnam in 2009. In 2007, UNICEF presented the Magees with a special recognition on behalf of Operation Smile and he received the Distinguished Service Award from the American Society of Plastic Surgeons. He entered into the Plastic Surgery Practice in Norfolk, VA in 1978 and became President of the group, which at the time was the largest private training program in the USA. In 2016, Dr. Magee stepped away from his private practice but continues to invest all of his effort and energy into Operation Smile. Kathleen S. Magee, B.S.N., M.Ed., M.S.W., a former nurse and clinical social worker, founded Operation Smile in 1982 with her husband, William P. Magee Jr., D.D.S., M.D. Ms. Magee serves as the president of Operation Smile on a full-time, volunteer basis and is a lifetime member of the Board of Directors. A dedicated advocate for children around the world, Ms. Magee travels overseas extensively to nurture and maintain key corporate, diplomatic and medical partnerships that enable Operation Smile to carry out its surgical missions. 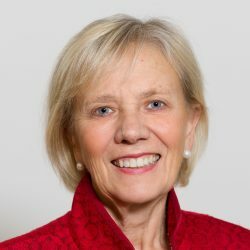 She has been instrumental in establishing several Operation Smile international foundations, which handle all of the logistical aspects of the medical missions and has led a majority of the organization’s fact finding missions. Ms. Magee is deeply involved with Operation Smile's Student Programs, which provide the opportunity for students to learn about volunteerism and support Operation Smile's work by raising funds and awareness. Since the mid-1980s, Student Programs have grown to involve tens of thousands of students in more than 1,000 Student Associations around the world. Ms. Magee's work on behalf of children around the world has led to the receipt of numerous awards and honors including the first $1 million Conrad N. Hilton Humanitarian Prize in 1996 for "… exemplary and significant contributions to ease human suffering" and the Servants of Peace Award from the UN representative to the Vatican in 1997. In 1999, the Magees received the Golden Plate Award, "representing the many who excel in the great fields of endeavor" by the American Academy of Achievement. In February 2004, Ms. Magee was inducted into the Toledo-based Medical Mission Hall of Fame, in honor of making a difference in the health of her fellow human beings; and in 2004, the organization was awarded The Humanitarian Rose Award from The People’s Princess Charitable Foundation, Inc., London, England. In 2005 Ms. Magee was awarded the Operation Smile Lifetime Volunteer Achievement Award, and in 2007, USAID presented the Magees with the President’s Call to Service Award from President George W. Bush. Ms. Magee is the recipient of honorary degrees from Fordham University, Mt. St. Mary's College, Loyola College, Old Dominion University, College Misericordia and Denison University and was inducted into the Alumni Association Hall of Fame at the University of Maryland in 2000. In 2014, she received a prestigious honorary doctorate from the Karolinska Instituet in Sweden. She also serves as a member of the Executive Committee for the Hilton Laureates Collaborative. A New Jersey native, Ms. Magee received her B.S.N. from College Misericordia in Pennsylvania, her M.Ed. from the University of Maryland and her M.S.W. from Norfolk State University in Virginia. She also completed graduate work at the University of Virginia and the Jung Institute in Switzerland. The Magees reside in Norfolk, Va., and have five grown children, all of whom have served on medical missions and are active in volunteer work for Operation Smile. In addition, the Magees have 14 grandchildren.